Four spacious en-suite bedrooms are contained within the main villa and a fifth king size en-suite bedroom is located in a separate pavilion away from the main villa. All bedrooms feature air-conditioning, flat screen TV’s with cable, DVD player, and safety deposit boxes. Each room has been individually styled with contemporary soft furnishings, the highest grade fresh white linen and pillows for your absolute comfort. 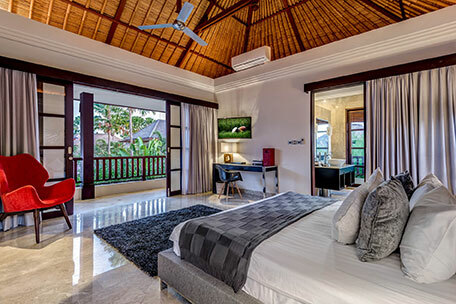 All rooms within the main villa have private fully enclosed en-suite bathrooms, while the pavilion bedroom features an indoor/outdoor bathroom with full size bath and rain shower. 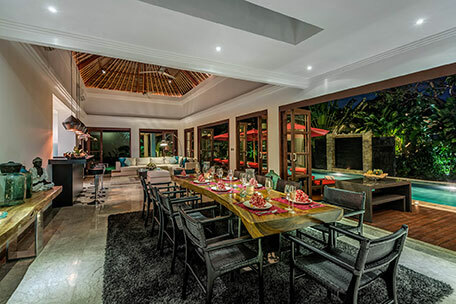 The large living/dining/kitchen area is fully air-conditioned with by-fold doors surrounding, allowing the area to be opened onto the pool deck and garden to create a typically Balinese open-air pavilion. The living area features a 47 inch flat screen 3D TV with surround sound and an extensive 3D movie library available for your enjoyment. 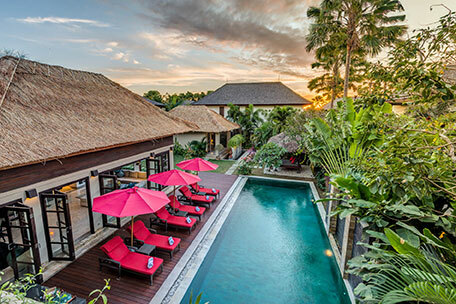 Sitting on over 800 sqm of land with lush tropical gardens and level lawns, Koi carp fish pond and water features. Nilaya’s Gardens are the perfect place to relax and unwind. The private 15m x 5m pool is joined by a full length timber deck with sun lounges and umbrellas, while at one end of the pool you have an inviting bale, just perfect for an afternoon nap, reading a book, or just relaxing.